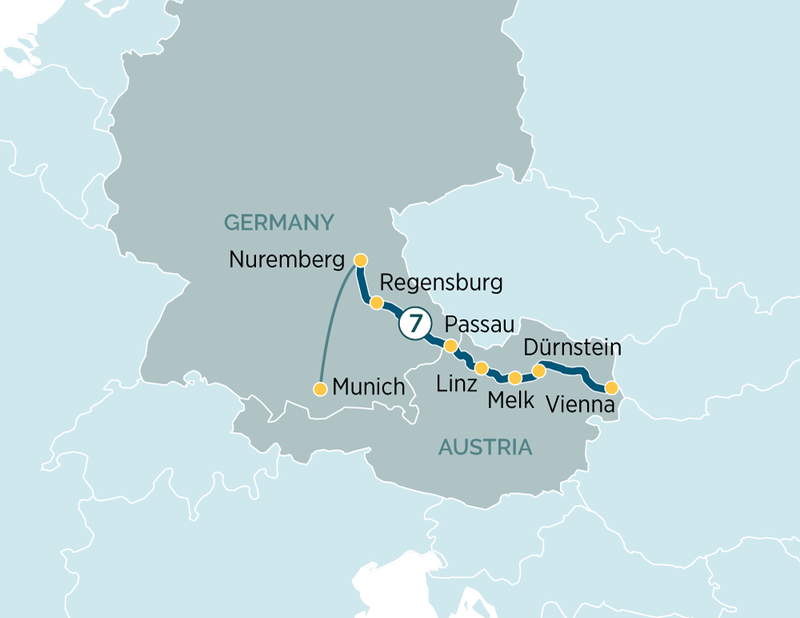 Linking elegant cities and beautiful landscapes, this 8-day river cruise between Nuremberg and Vienna is a classic European passage beloved by generations of travellers. Your journey starts in Nuremberg, where a tour showcases the city’s historic highlights, from the 900-year-old medieval city walls to the Nazi rally grounds. From here you’ll pass through traditional Germanic countryside to reach Regensburg, a medieval city whose cobblestoned streets lead to landmarks of arresting heritage, and a collection of the oldest bridges on the Danube. Weaving steadily towards the Austrian border, Passau enthrals with its Baroque highlights and imposing hilltop Oberhaus Fortress, yours to discover during an included tour of Passau. As you travel into the Wachau Valley region of northern Austria, enjoy a guided hike to Dürnstein Castle or a guided biking tour along the river bank, taking in the beauty of Melk Abbey. Then you’ll head to Vienna, the capital of classical music, and here you can enjoy a guided tour of the Ringstrasse, home to some of the city’s most famous landmarks, including the Spanish Riding School, Burgtheater and the Opera House. Your time on-board concludes with a special farewell dinner, giving you time to raise a toast to the memorable highlights of the Danube.